Home > Ask Our Experts > Should I Have a Contract of Employment by Now? I have recently started work and as yet have not received a contract of employment. Am I employed or still on a trial basis? 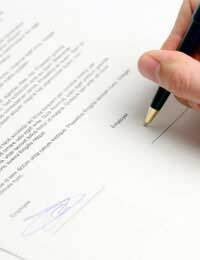 As soon as you accepted a job offer and you and your employer agreed the basic outline of your job responsibilities and you were given a start date then, in effect, you entered into an employment ‘contract’. Although the vast majority of people will have a written employment contract drawn up, there are many who simply work on the basis of a verbal agreement even though their entitlements and responsibilities are still the same. However, a written employment contract or at least a written ‘statement of employment particulars’ setting out the main terms of your employment is a good record to have so that both you and your employer know where each of you stand. Whether it’s a formal employment contract or a written statement it should include details of your pay, the hours you are required to work, sick pay arrangements, holiday entitlement, notice periods and any information with regard to disciplinary and grievance procedures although the latter can often be found in a separate staff handbook. Without written proof, it’s often difficult to challenge any particular aspects of your employment which you may not agree with or where you’re expected to do something that was not verbally agreed to at the time you accepted the job offer. Therefore, if you’ve been working for the company for 2 months, your employer is required by law to give you something in writing which sets out the above – whether it’s a formal contract of employment or some kind of written statement. As to whether you’re employed or still on a trial basis, that will be determined by what your employer has set out as the length and conditions of the trial period. You might find, for example, that even with an employment contract, you might still be on trial. That’s why it’s better for you to have a written copy of the terms of your employment as you won’t have exactly the same rights when you’re on a trial period as you would if you were a full member of staff, particularly with regards to your employer releasing you without notice. Although that said, if you’re on trial, you’ve no need to give them notice either if you decide to leave if that’s not been discussed and drawn up into some form of written agreement. Trial periods are often referred to as ‘probationary’ periods after which, following successful completion, you have the same entitlements and rights as the rest of the workforce should your employer decide to take you on as a permanent member of staff. So, if you have worked for the company for 2 months or more, your employer must give you a written contract or statement if you ask them to supply you with one. @JC - I think you would have to seek legal advice on this question as it depends on what the clauses on the specific contracts are in relation to breaking agreements early.